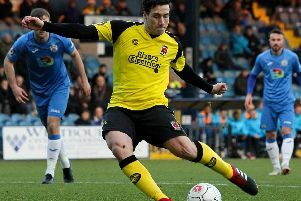 Matt Jansen believes the signing of a “marquee” front man would be the final piece of his Chorley jigsaw. The Magpies are looking to replace Darren Stephenson after he left for National League Tranmere. Jansen already has Sefton Gonzales, Marcus Carver and Jordan Connerton at his disposal but believes a fourth striker would set his side up nicely for the new season. He said: “I’m very happy (with the squad). “There’s maybe one more player, we lost Daz obviously. “In terms of strength of attacking options, Sefton Gonzales, Jordan Connerton and Marcus Carver have been fantastic. “But I’m looking for that fourth striker. “We’ve got a couple of young lads at the moment who need to prove themselves but it would be nice to get a little bit of a marquee signing in place of Darren because he was outstanding for us last season. Jansen is pleased with his squad from back to front, his side impressing in the 2-1 defeat to Preston North End on Saturday. He said: “We’ve made some really strong additions to the side all over and I think we’re stronger than last season. “We’re more prepared than we were last season. “I’m pretty sure the league is going to be tougher than last season with the teams that have come up and the teams that have come down but I think we’re more than ready. “It’s pre-season and there’s lots of changes, we’re looking at different things to get our strongest 11 found out before the start of the season. “They all gave a great account of themselves against Preston. Chorley next host National League Southport tonight, Tuesday as their build-up to the new season continues.